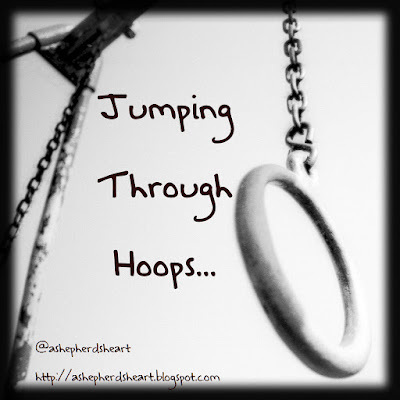 Sometimes in life you come across "Hoops to Jump Through" and you have to decide whether or not to jump through said hoops. For whatever reason some in leadership including those who should be encouraging you and believe in you (Leaders and even "friends") have expectations of others that they themselves couldn't even meet if they faced the same expectations. None-the-less sometimes they will expect you to jump through hoop after hoop until they'll recognize your abilities, skills and efforts. Yes, it would be much simpler if they'd see and pay attention to your efforts first so the hoops can be avoided but it comes to a point again, where you have to decide if you're willing to continue to jump through the hoops, which hoops to jump through and when enough is enough. It's also been my observation that many who have continued to jump through many various hoops for these individuals have washed out in the end because they were successful just on the surface but not within them as they lacked the character and true abilities needed. You weren't meant to be ignored or used as a doormat - your success, worth, etc is as important or more so than those who don't seem to value you. TO BE CLEAR: You are valuable, worthy, and of worth no matter what they do or do not do to show you that you are and encourage you on the path your on. Maybe as I look back on life, I've jumped through the wrong hoops for people who never cared about me or my success etc in the first place and going forward...I pray that won't be the case anymore. Let's pray for wisdom and discernment. Let's be faithful and stay the course that we're supposed to be on and steer clear of the ones where the proverbial red flags start showing up in life, work and ministry. Let's value others and pay attention to what they do and what they are faithful and good at...and recognize them and yes, reward them for it.